a new study in a high carbon content paddy field of West Bengal has questioned India's projected methane emission levels, suggesting that if rigorous research is carried out in the eastern and north-eastern parts of the country on high carbon agricultural land, our methane emission figures might actually go up a few notches. The study, conducted in the Lakshmikantapur area, 75 km south of Kolkata, for two full crop years, has also reported two peak emission periods per crop as opposed to earlier studies which showed one peak emission period. India's paddy field methane emission data is primarily derived from low-carbon lands spread across the country. However, this study carried out by University of Calcutta's S K Mitra Centre for Research in Space Environment, shows that during the 2003-04 kharif season the peak methane emission touched 16.5 mg per square metre per hour and in rabi season it was 12.5 mg/sq m/hr.This presents a stark contrast with studies conducted by the National Physical Laboratory (npl), Delhi, on low carbon fields like Pant Nagar in Uttar Pradesh, where 7,070 mg per square metre of methane was emitted in the entire kharif season. There is no hourly data measured from this region but roughly converted, this would mean 2.46 mg/sq m/hr. N N Purkait of the university and D K Chakraborty, a scientist formerly with npl, studied emissions in these fields during 1998-99 and 2003-04. The soil carbon content here was between 0.89 and 1.08 per cent as compared to low-carbon fields (less than 0.7 per cent). The comparison was based on the assumption that no organic fertiliser was used in the fields. Emission fields Methane contributes a greenhouse effect of around 1.7 watt per square metre. Its concentration has been increasing at the rate of 1 per cent per year due to human activities. un's Intergovernmental Panel on Climate Change estimates that at the current rate it could contribute an additional 0.5 watt per metre square in radiative heating in the next 50 years. About 20 per cent of total methane in the atmosphere comes from paddy fields. 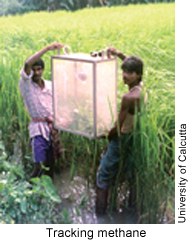 In India, measurements of methane emission from paddy fields were initiated in the late 1980s. The eastern region, with a major coal field belt, has high carbon content. In West Bengal, soil carbon content is between 0.74 and 1.36 per cent. Nearly 6 million hectares of land in the state is under rice and the total methane emitted is nearly 1 teragram (1012 gm) per year. This represents a fair share of India's total harvested rice area of 42.23 million hectares and total methane emission of around 5 terra gram per year. "This high value in the eastern region is due to the presence of higher percentage of organic carbon in the soil," Purkait says. The team chose two plots from this area, one for the kharif and the other for the rabi. Observations were taken from August to January for the kharif crop and from January to May for the rabi crop. They found that emission was maximum in the afternoon and that it had a direct link with temperature. The team found two peak emission periods--one after panicle emergence and the other after flowering--in both the crops; for kharif, the first peak was larger than the second one and for rabi, the second peak was larger than the first. Prabhat Gupta of npl's analytical chemistry division agrees with the findings. Gupta, who compiled a database of methane emissions from paddy fields across the country as part of India's methane campaign in 1991, says data on the influence of soil type on such emissions in India was scarce. Poor calculation "Limited studies indicate high emission values in some soils at Jorhat (Assam), Kuttanad (Kerala) and Gaberia (West Bengal). We have observed from the decadal data that emissions changed appreciably when soil organic carbon varied," he says. Gupta confirms that a good deal of uncertainty in calculating India's methane budgets can be reduced if data is categorised according to soil carbon levels and use of organic fertilisers. "Some ground truths in data quality certainly need a relook. We don't have information on the exact area under high carbon paddy cultivation. Figures with the Soil Survey of India are too sketchy for scientific estimates," he says. Atmosphere scientist A P Mitra, who headed the adb-sponsored Methane Asia Campaign in 1998, showed in a study that soil carbon influenced methane emissions. 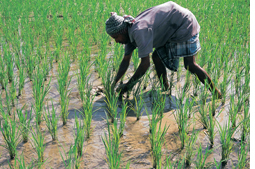 His study, published in Nutrient Cycling in Agroecosystems in 2002, compiled data from India, China, Indonesia, Philippines, Vietnam and Thailand to conclude that average methane emissions from continuously flooded paddy fields with high carbon content was 36 gm per square metre as opposed to 12 in low carbon fields. The average ipcc emission factor is 20 gram per square metre. These six countries together account for 70 per cent of the world's paddy harvest area. "There is need to revise emission factors laid down by ipcc in the light of these studies for different paddy growing ecosystems," he says. Gupta, who participated in the second national communication meet of the Ministry of Environment and Forests on May 29, says there were vocal demands by members to reduce these uncertainties in data collection to reflect India's exact state of greenhouse emissions. Gupta is also a member of isro's geosphere and biosphere programme which will soon begin mapping India's farmlands based on soil parameters including carbon content.